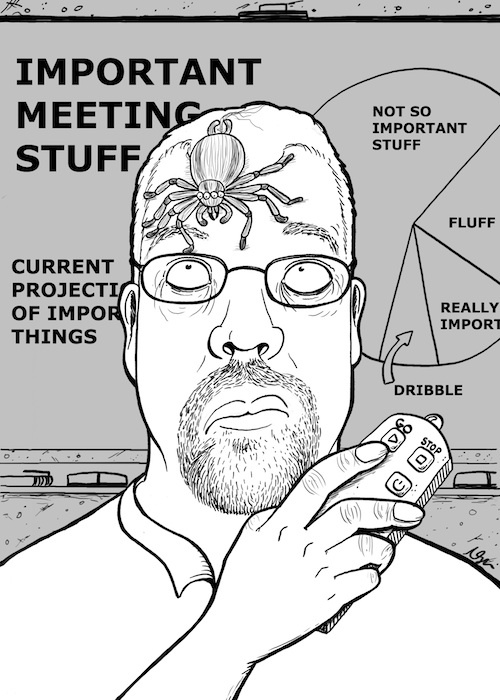 Spider on My Head: Day 5 | Kris Johnson's Blog…sort of. I think it’s safe to say that the tenuous link between reality and fantasy has been severed in today’s illustration. I mean, when was the last time Important Stuff—even as an abstract—was discussed in a meeting? Art by Natalize Metzger (AKA, The Fuzzy Slug). Click for embiggory. FUN FACT: Spiders are not my Apex Phobia. I believe they rank 3rd, overall. Immediately above spiders: heights. At the very top of the list: losing my glasses. I don’t even know if there’s a proper -phobia name for that. I see what you did there, Wesley. Probably because I haven’t lost my glasses. Perhaps it’s time for lasik. Given the choice between a spider on my head and a LASER in my eye, I’ll take the spider.